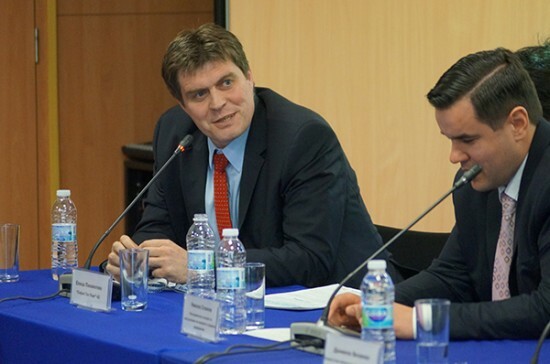 On April 14, 2015 Ivaylo Slavov, BULPROS CEO and a Board member of the Bulgarian Outsourcing Association, took part in the fourth edition of the Bulgarian ICT Watch forum entitled ”Economic progress through export of ICT products and services” on behalf of the association. During the 2015 edition of the roundtable, representatives of the state, branch organizations and ICT companies and consultants reviewed the current state of Bulgarian export of ICT products and services, export opportunities and target markets. The discussions focused on identifying software products and services with the highest potential to contribute to the growing ICT exports. The data showed that the following software products and services have the strongest potential for export: educational applications, insurance software, ERP systems, manufacturing execution systems, data processing software and software development services. The forum was organized by ICT Media, the Bulgarian Association of Software Companies (BASSCOM) in partnership with the Ministry of Economy of the Republic of Bulgaria, InvestBulgaria Agency (IBA), Bulgarian Small and Medium Enterprises Promotion Agency (BSMEPA), Bulgarian Association of Information Technologies (BAIT), Bulgarian Outsourcing Association (BOA). The discussion took place at the European Commission Representation in Bulgaria. The BULGARIAN ICT WATCH roundtable is a project which aims to help and facilitate the dialogue and partnership opportunities between the state and ICT businesses regarding high-tech export. BULPROS is a fast-growing European IT Services company established in Sofia, Bulgaria, which already operates on many European and global markets. BULPROS provides the whole spectrum of IT lifecycle services – software development in all core technologies, design and development of web and mobile solutions and applications, Infrastructure services and Cloud. To support the operations of the clients` IT systems BULPROS provides customer services including helpdesk, application and infrastructure technical support, content and data services as well as telesales and telemarketing services. BULPROS’ Legal Process Outsourcing business line combines processes, technology and fully trained lawyers and paralegals with multilingual knowledge to deliver support services which truly benefit law firms and in-house legal departments. BULPROS team consists of more than 400 consultants in the different professional areas, described in the company’s portfolio.